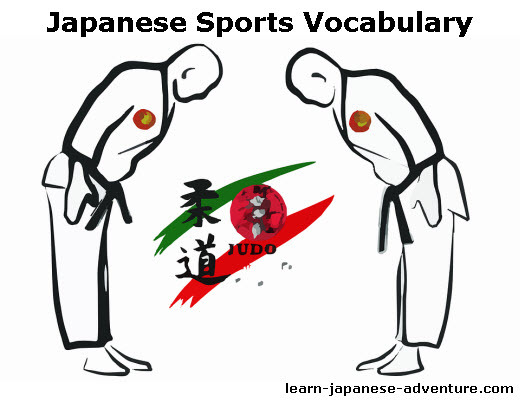 This section covers Japanese sports words and vocabulary and those related to sports in Japan. I'm sure you have seen on television some of the traditional sports of Japanese such as 相撲 (sumou - Sumo Wrestling), 柔道 (juudou - Judo) and 空手 (karate - Karate), etc. While Japanese sport like Sumo can only be seen in Japan, Judo has long been one of the sports in Olympics. However, the most popular sports in Japan are imported sports like Baseball and Soccer because they have the most spectators. Both Baseball and Soccer in Japan have their own professional sports leagues, Nippon Professional Baseball League and Japan Professional Football League respectively. As many sports are imported from other countries, they are mainly named using katakana as you shall see in the following Japanese sports word list. Let's see the common Japanese sports words in our list. These are some common Japanese sports words collected in the word list. I will continue to look for other Japanese sports words and add to the list.